Platonic friendships rarely find a home in the cinema, at least not as the centerpiece of a motion picture. It’s more dramatic to depict a family or lovers, or the relationship between a boy and his [insert pet type here]. Friendship may be the emotional backdrop of an adventure story or fairy tale, but how often do moviegoers experience something like Mary and Max, where there’s nothing but the back-and-forth communication between pen pals? Each letter builds on the eccentric lives of its two participants, and as more letters are written, the characters become entirely real, their friendship distanced but heartwarming. That’s the story. Simple. And sort of brilliant for it. 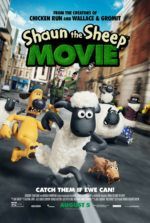 Fleshing out the characters comes effortless for this film, which is amazing, considering it’s told through stop-motion animation, sometimes known as claymation—the same style used for Wallace & Gromit, and mimicked in Flushed Away. 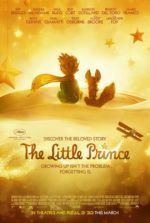 Imported from Australia, its writer-director Adam Elliot also made Harvie Krumpet, the Oscar winner for Best Animated Short in 2003. Five years in the making, Mary and Max, his first feature-length film, was featured as an opening night selection in this year’s Sundance Film Festival. In a short time, Elliot has claimed his own independent voice in the animation world. Let’s hope he maintains that voice, and that he avoids falling into the trendy trap of 3-D distribution to blockbuster-sized crowds. Half of this delightfully dark comedy takes place in Mount Waverly, a suburb of Melbourne, Australia, in 1976. Young and awkward, 8-year-old Mary Daisy Dinkle (voice of Bethany Whitmore, and later voiced by Toni Collette) lives with her Sherry-drunk mother and taxidermy-obsessed father. She’s a bit overweight and wears square, thick-rimmed glasses. Her favorite activity is watching the cartoon “The Noblets” with her pet rooster while eating her favorite food: sweetened condensed milk straight from the can. She also loves chocolate. Her neighbor, Damien Papadopoulos (Eric Bana), has a stuttering problem, but she thinks he’s dreamy. At school, she’s picked on about the birthmark on her forehead, which is “the color of poo.” Ironically, her favorite color is brown. This is all in the letter she sends at random to an address in New York City, wherein she also asks the 44-year-old stranger, Max Jerry Horovitz (voice of Philip Seymour Hoffman), where babies come from. She was told they come from the bottom of dads’ beer mugs, and she wonders if it’s different in America. Her letter disrupts the strictly routine lifestyle of Max, an introverted, overweight Jewish man with Asperger syndrome. He rocks in the corner nervously whenever he receives one of her letters, unsure how to react to her innocently inquisitive questions. But curiously, they have similar tastes. Max watches “The Noblets” too. He loves chocolate, and attends regular Overeaters Anonymous meetings, where the instructor reminds him “God hates fat people.” Not that it matters—he’s an atheist, but he wears a yarmulke to keep his brain warm. Max admits he has trouble understanding most humans, why they litter and make so much noise. He was attacked by a crow once on a Thursday; now on Thursdays, he wears a helmet with eyes painted on top to ward off birds. And yet, he doesn’t understand why people look at him strangely. Max doesn’t understand most things, but he tries with Mary. They exchange letters regularly, writing about chocolate hot dogs, Mary’s other agoraphobic neighbor (who she calls “homophobic”), Max’s halitosis-suffering cat Hal, her homemade Noblet figurines, and his imaginary friend Mr. Ravioli. As time passes, Mary grows up, Max grows heavier, and breaks in the letters occur. There’s an eight-month gap of silence when Max is institutionalized after Mary asks him about love and “sexing”. He goes into a catatonic stupor, as love is something that scares him and doesn’t make sense in his obsessively literal, logical brain. Through it all, the film balances between the strangeness of two lifelong friends and their heartfelt confessions to one another. The film reveals deeply personal secrets in the forthright way you would write a pen pal on the other side of the world—by just saying it, without reservations, either in letter form or by what Elliot’s wonderfully stylized world shows us. Max’s world is depicted almost entirely in shades of gray, with the occasional hint of red; his city is scummy and smoky. Mary’s world comes in light browns, sprinklings of color more frequent. Whitmore and Hoffman, who disappear into their voice roles, read their characters’ letters aloud, and Barry Humphries narrates the story. We almost never see the characters speak for themselves; rather, the entire story is told through the oration of their correspondence. Misfits both, they tell saddening stories so touching that we instantly forget Elliot’s medium. 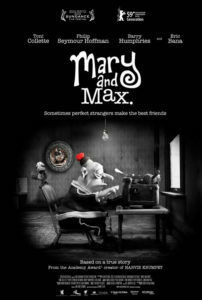 Though rated PG, the glum Mary and Max might be appropriate only for the wisest of children, if at all. Amid letters lined with bizarre forms of chocolate and visuals ripe with scatological humor, the ugly duckling characters share thoughts of anxiety, addiction, depression, and feelings of severe displacement within the world. This is dark, very heavy, but very Harold and Maude stuff. The film’s claim to that ever-suspicious title “based on a true story” goes without question, as these personalities feel too tangible and complicated to be synthetic. But should the reality of this story be greatly exaggerated by Elliot, it only further attests to his abilities as a storyteller. His talents as an animator, however, are evident in every carefully composed frame.